542' by 65' by 27'8"
The Langley was the first United States aircraft carrier, converted from the collier Jupiter in 1922. Jupiter was the first U.S. Navy ship with turboelectric drive, and this was retained after the conversion. She provided invaluable experience with carrier operations but was much too primitive a design for fleet operations. She was converted to a seaplane tender in 1937 by removing the forward portion of the flight deck to install a handling crane, and she was assigned to Asiatic Fleet. 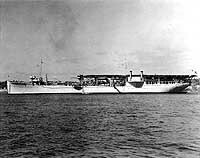 In this role, she served as a floating base for the Asiatic Fleet's aircraft, for which there were inadequate shore facilities because of the fortifications clause of the Washington Treaty. Her large deck area gave ample space for bringing aircraft aboard for maintenance and repair. Langley was at Cavite at the outbreak of war, but was crippled by Japanese aircraft south of Java on 27 February 1942 while acting as an aircraft ferry. Her escorts were compelled to scuttled her.